I have found that the more we travel, the more I tend to seek out more unique places to stay. I’ve always enjoyed smaller, boutique hotels to big chain establishments, and with the advent of AirBNB and similar services, I’ve begun to seek out more interesting places at which to rest our heads in the evening. 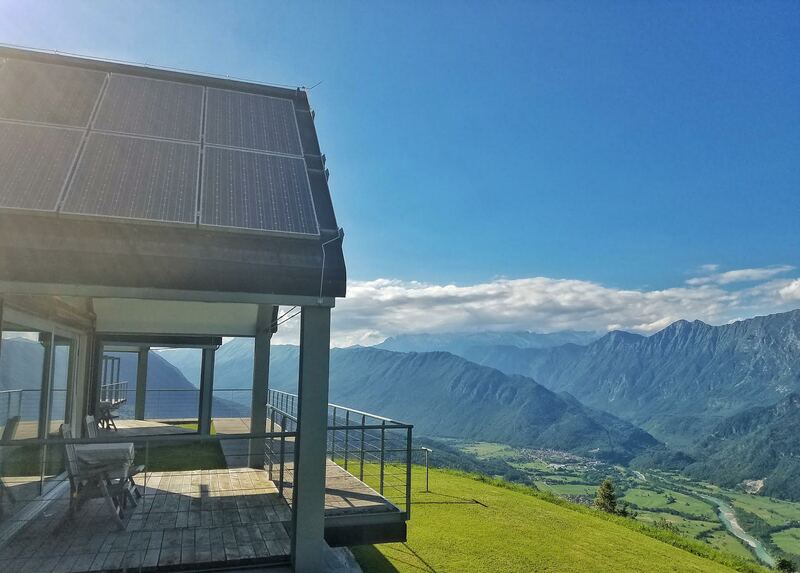 Slovenia in particular seemed to have an abundance of uncommon and unusual places to stay, and I booked us in a varied and interesting mix of accommodations. Here are our favorite dwellings in which we stayed while in the country. 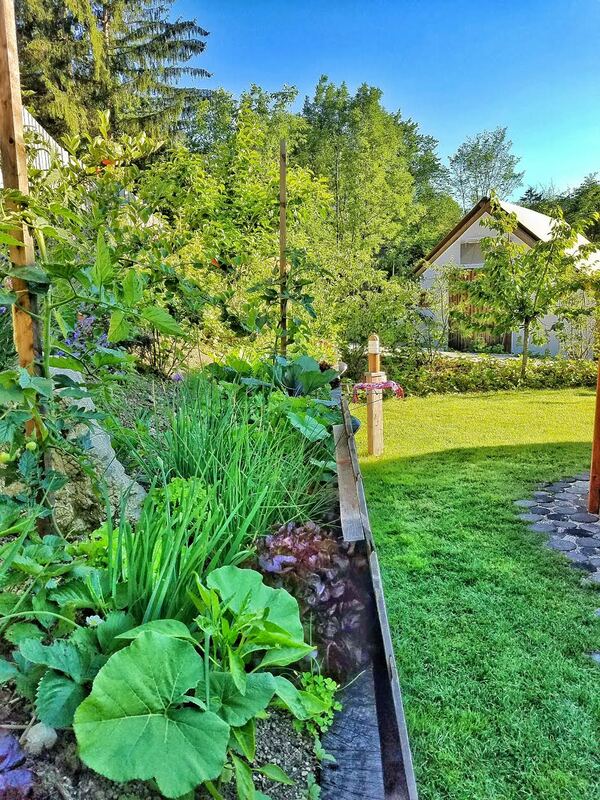 What a unique and amazing experience we had at Garden Village, located in Bled! 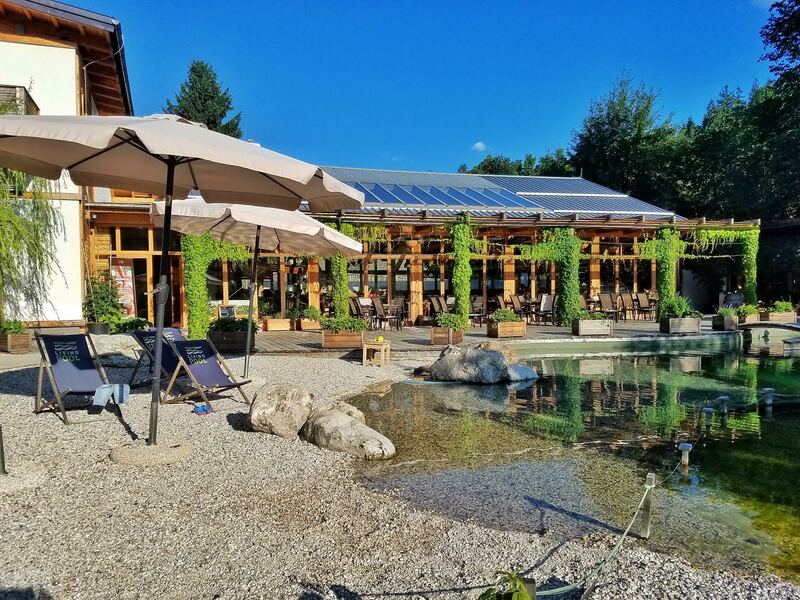 Garden Village is an eco-resort, obtaining it’s electricity from solar power, and much of it’s food served in the restaurant from the gardens located all over the property. 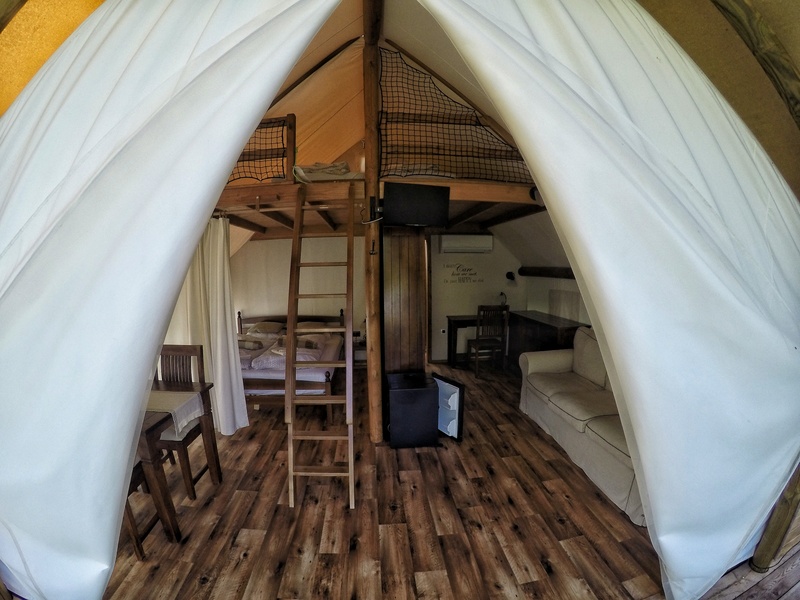 There are different types of “rooms” you can book at Garden Village: You can choose from a treehouse, pier tent, or the one we chose, the “Glamping Tent”. It’s hard to put into words how amazing this little place was. 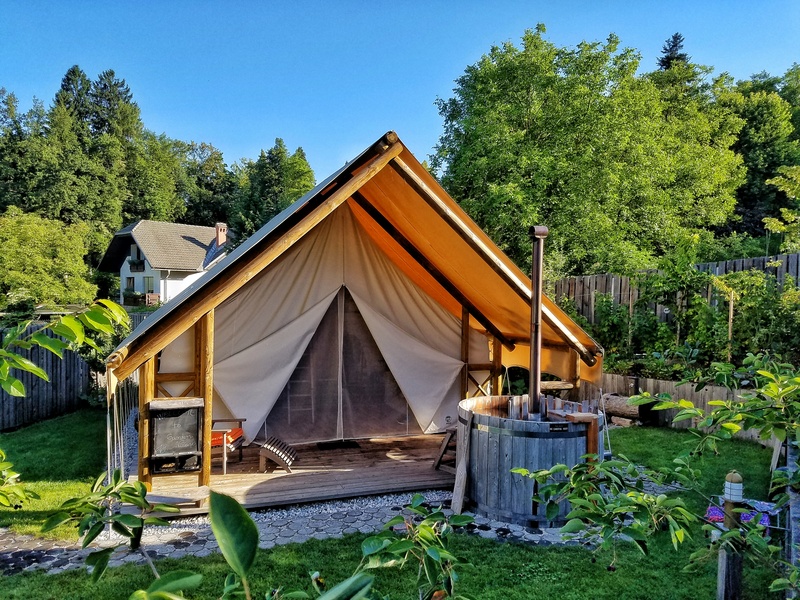 Our tent had its own private yard, on which it contained probably no less than 30 different varieties of fruit and vegetable plants growing around the perimeter. 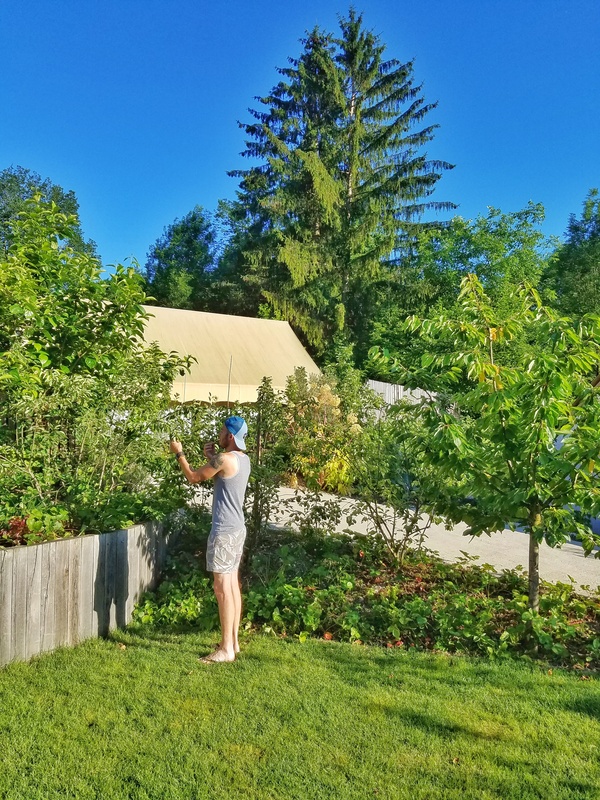 I enjoyed picking and eating fresh food from the plants each evening, it really doesn’t get more fresh and locally sourced than this! Our tent also had its own small hot tub just outside, heated completely by a wood burning stove. Staying in the “tent” was certainly far from roughing it. It came complete with air conditioning, a private bathroom and outdoor shower, queen bed and satellite TV. We loved sitting out each evening on our little porch catching up on the days activities and just relaxing after our daily adventures around the lake. 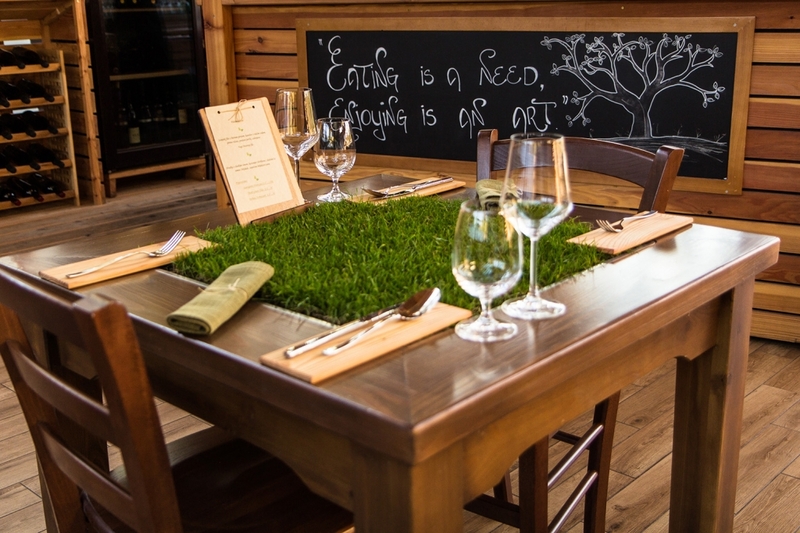 Breakfast was served each morning in the onsite restaurant, where you ate on living grass-topped tables, a wholly unique dining experience. 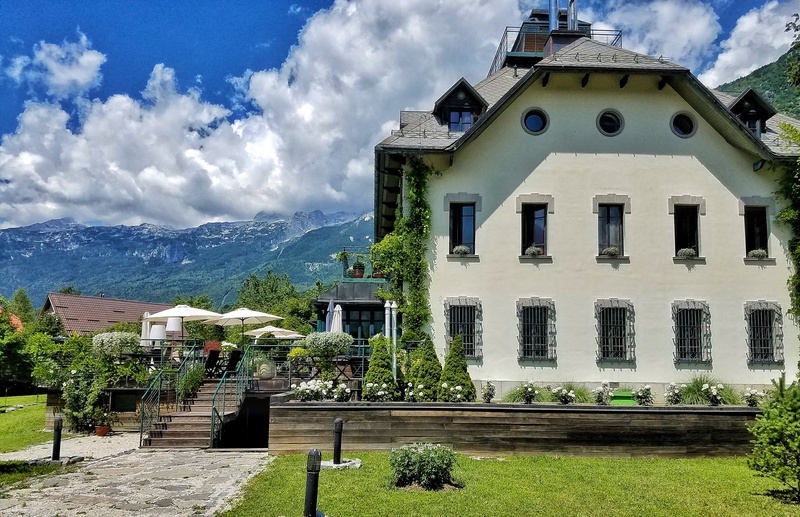 Bovec was one of our favorite villages in the country of Slovenia, and the boutique hotel at which we stayed here, called Dobra Vila, helped to make our time in this charming town even more special. The rooms are numbered not based on which floor they’re located on, or what order they fall in the hallway; rather, each room number has a special meaning. Our room number, for example, was 106, the height in meters of the nearby Boka waterfall. Just across the hall from us was room 2300, the height in meters of Mount Kanin, a popular Slovenian ski slope. And just down the hall was room 69, apparently named for something romantic. The hotel has an old-fashioned feeling, while somehow still maintaining a modern touch. The rooms had towering 15 foot ceilings, and many areas of the hotel were decorated with floral wallpaper and long velvet drapes on the windows. 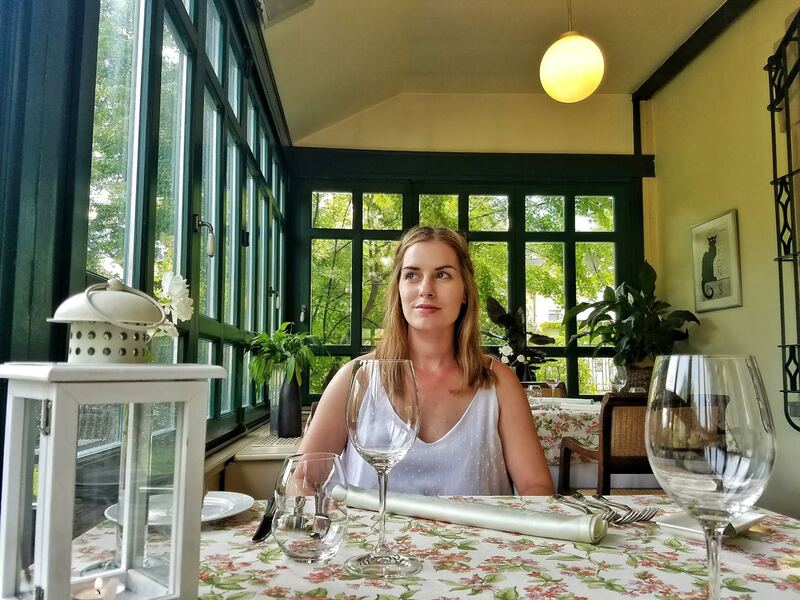 The whole effect was very charming, and the owners have done a tremendous job in creating a nostalgic atmosphere while not sacrificing modern day comforts. The onsite restaurant was of a very high quality. 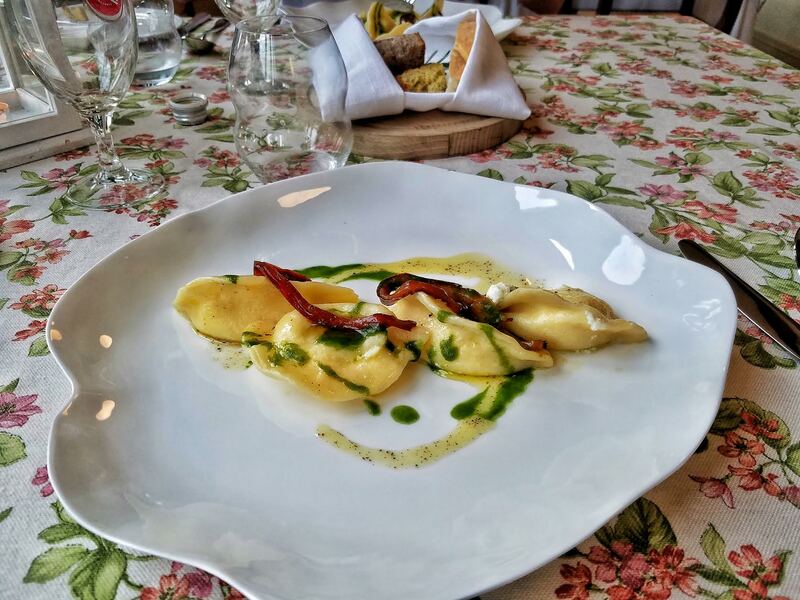 Staffed with some of Slovenia’s best chefs, each of the dishes served in our 4 course meal here were creative and delicious. They were happy to accommodate our vegetarian request, and we were impressed with the quality and presentation of each dish. The views from inside the sun filled dining area in which we ate were second to none, with the dramatic and jagged mountains towering all around us, looking like something straight out of the Lord of the Rings. 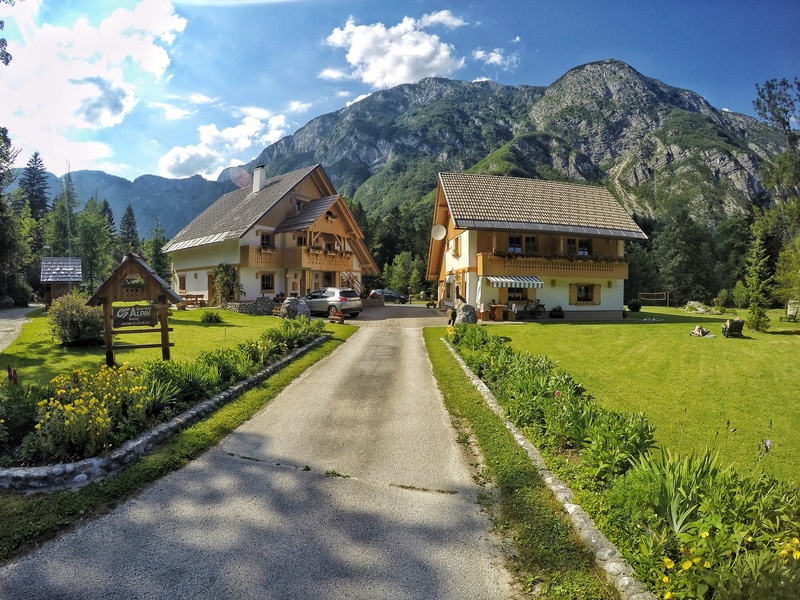 Our room here was cozy and was a great place to unwind after long days full of mountainous adventures and hours spent on the Soča River. Quite simply, Nebesa was the most amazing place I’ve ever stayed in all of our travels. It had everything I could possibly ask for in terms of location and amenities. 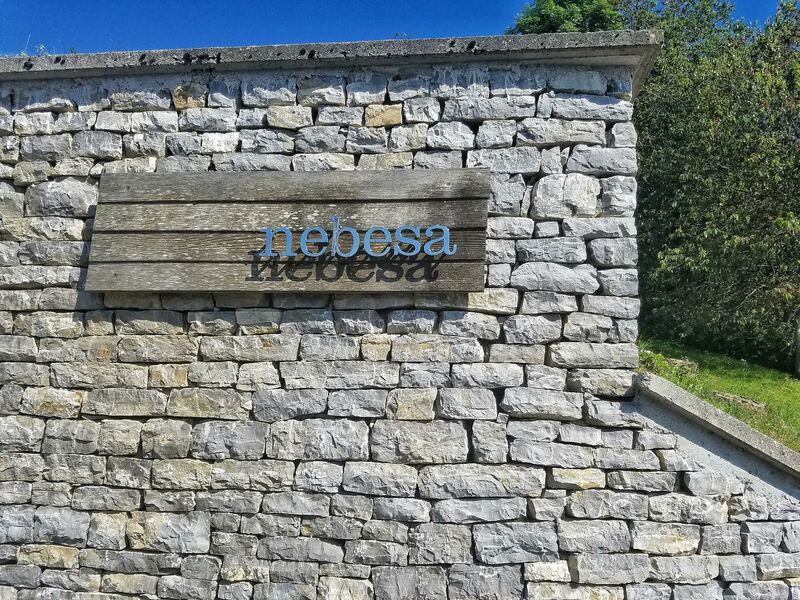 Nebesa is a small, family run operation located high up on a mountainside above the village of Kobarid. There are only 4 cabins here, so even at full capacity, you basically feel as though you have the place to yourself. To get here, it was necessary to take a steep, winding road up the side of the mountain. As we twisted our way ever higher up the mountain, our ears began to pop and the scenery began to become more dramatic. 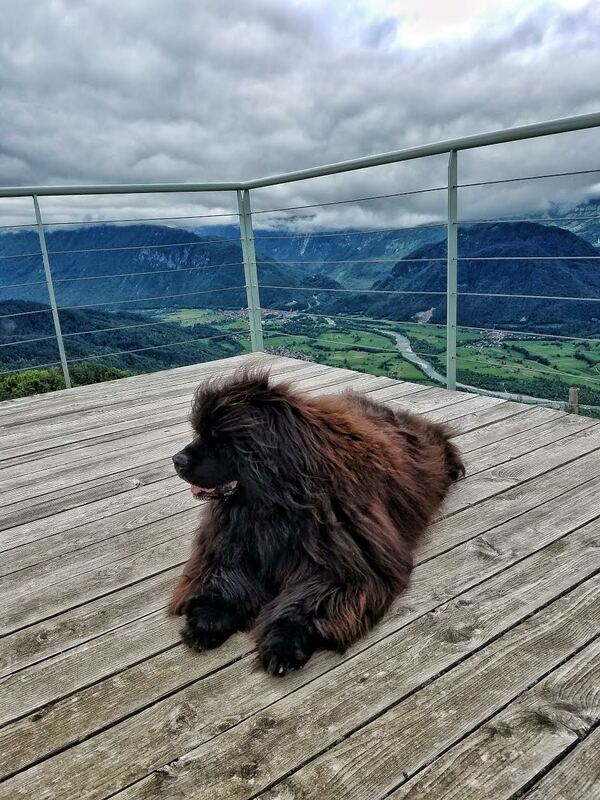 Eventually we arrived at the property and were immediately greeted by the very friendly owners who showed us around the property and offered numerous suggestions of hikes and activities to be found in the immediate vicinity. We were also introduced to the resident dog during our orientation, and he was quite a friendly fellow. 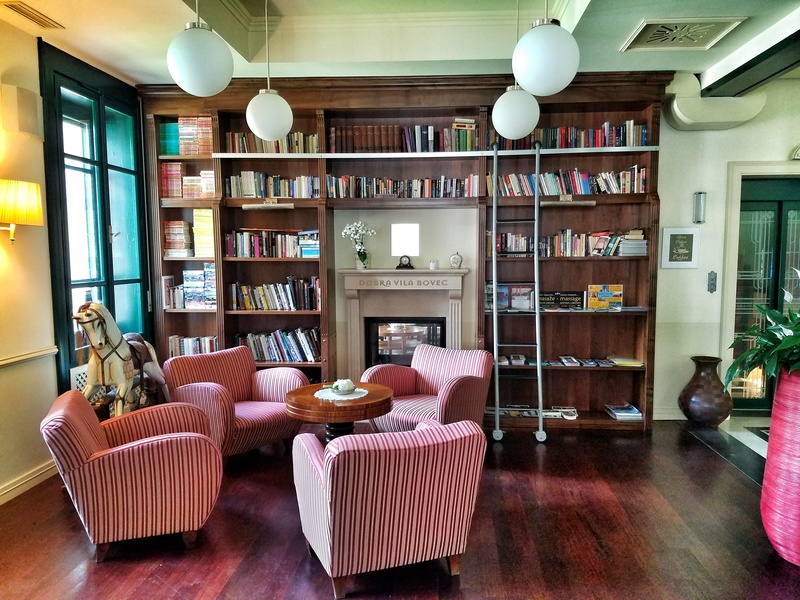 One of the cooler aspects of this property was the common room that was available to the guests. Here you had unlimited access to locally made mountain cheeses, local wines, bread, beers, and any number of basic items you can imagine. Each night we made ourselves a light dinner of a combination of these items, and it was quite filling and enjoyable to snack on while sitting on our balcony overlooking the valley. I also enjoyed learning how to make my morning coffee in the Italian style, using a macchinetta, a small pot that was available to us in the cottage and to which the owner’s daughter showed me how to use on our arrival. There was also a Finnish style sauna available for use which we made use of on our particularly cloudy and chilly arrival day. The most impressive aspect of Nebesa, however was the view. 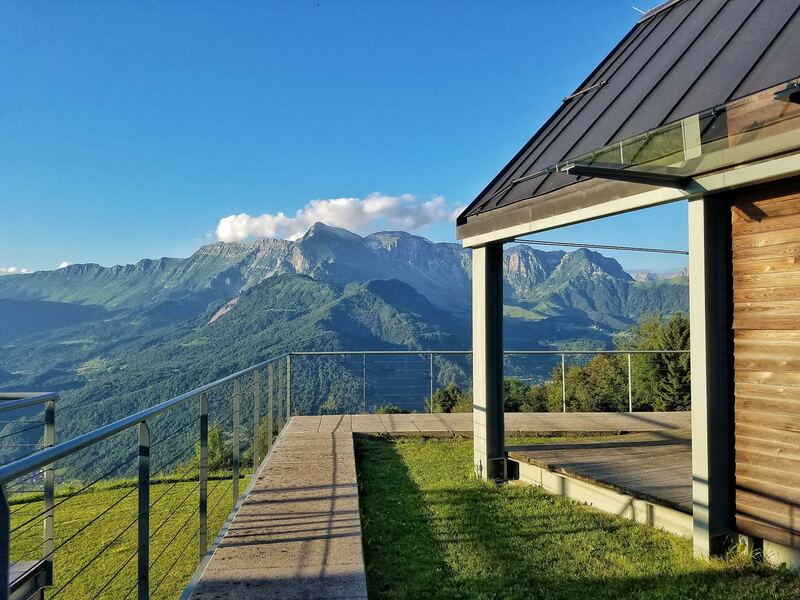 Perched very high above the Soča Valley, the town of Kobarid lay below us at the banks of the emerald Soča river, with towering peaks as far as the eye could see, all visible from the comfort of our balcony. From the back of the cottage, the city of Cividale, Italy lay in a valley in the distance far below, spectacularly lit with city lights each night after the sunset. 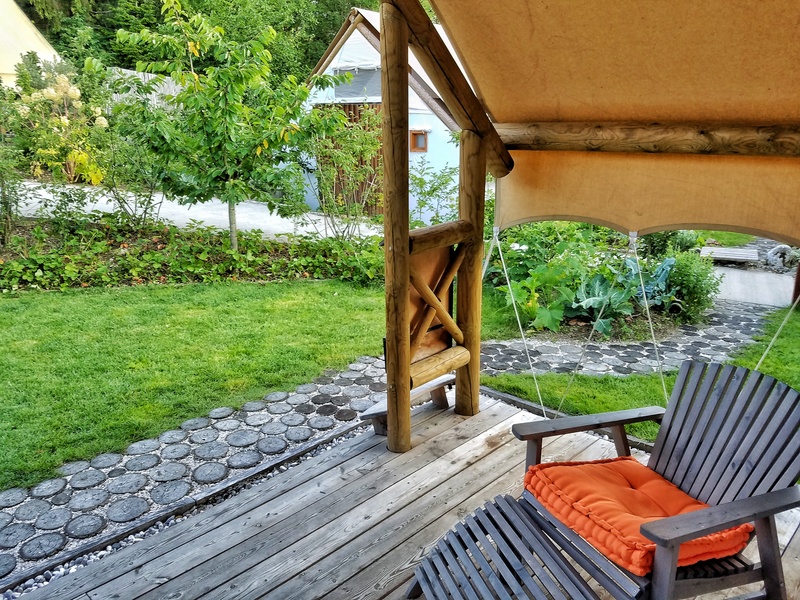 From the property, there are numerous mountain walks and hikes that you can embark upon, and a hut just a bit further up the mountain from the property serving a variety of hearty mountain foods. Nearby is also an open-air WWI museum, that we unfortunately did not find the time to visit. 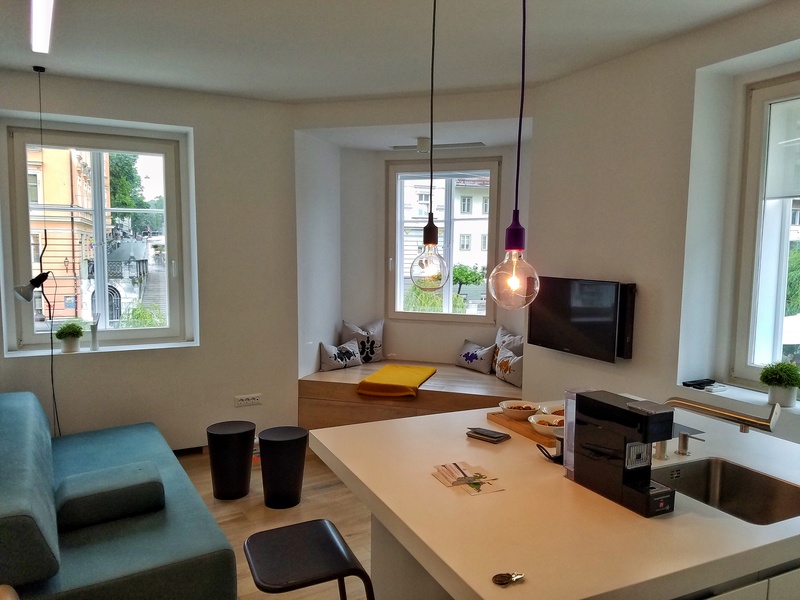 There may not be a more centrally located apartment in all of Ljubljana. 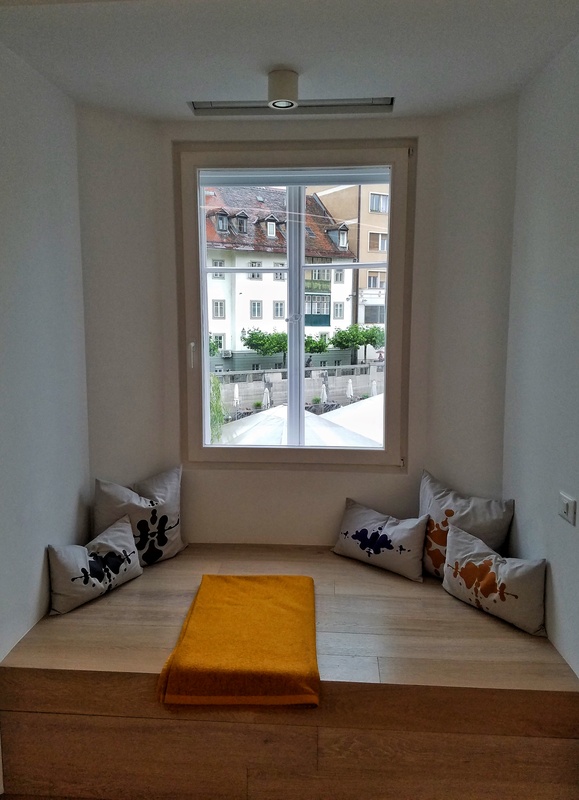 Small, modern, and very charming, Studio Apartment Emmi is located right in the heart of the very walkable old town. 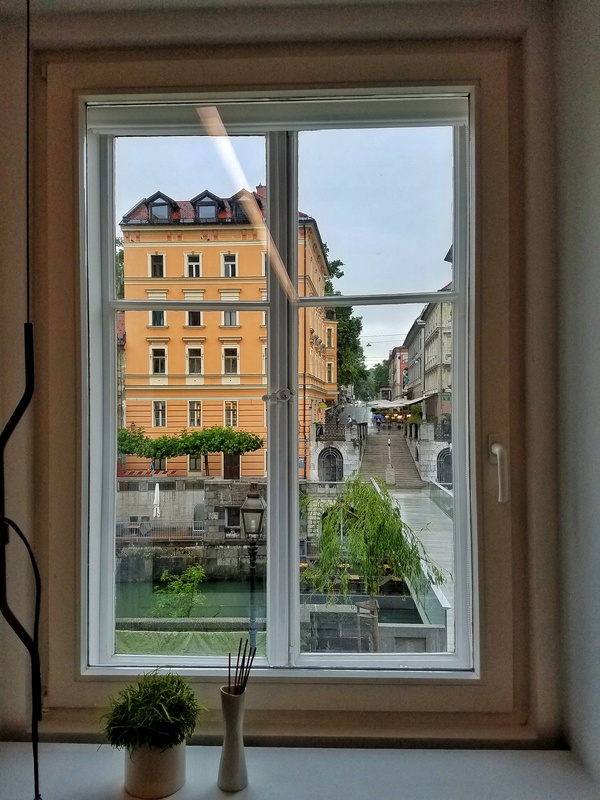 Just steps out the door you will find the cafe-lined Ljubljanica river that cuts through the heart of the town. From the windows of the apartment, we could look out onto the car free pedestrian zone of the city and watch the city slowly wake up in the mornings as I drank my coffee, getting ready for our day, and then in the evenings, witness the crowds hopping from cafe bar to cafe bar, in search of the perfect riverside seat. Upon our arrival, there were snacks and wine waiting for us. Nina, the property owner went above and beyond what a normal host might do, emailing me a few times prior to and during our stay to make sure everything was going well. I was impressed with the efficient use of the space here – what at first glance appears to be a wall, is a secret door that reveals storage: dishes, cups, and all other essentials remain out of sight and out of the way, making great use of the small studio space. We were fortunate to call this apartment our home on both the night of our arrival to Slovenia, as well as our final night in the country once we made our way back into Ljubljana. 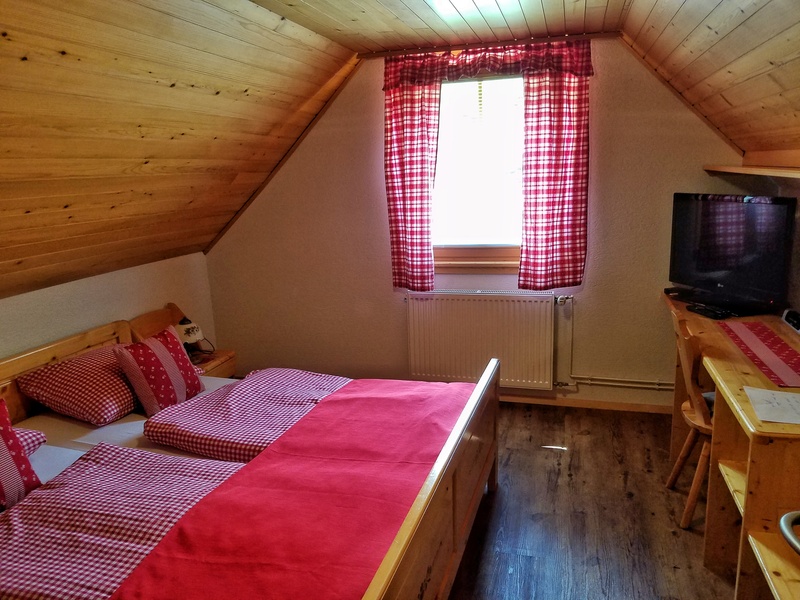 Located on the far western shores of the dramatic Lake Bohinj in the small village of Ukanc, Apartmaji Alpik could easily be mistaken for a traditional Swiss Chalet, with its wood facade and boxes overflowing with colorful flowers outside of the balconies. 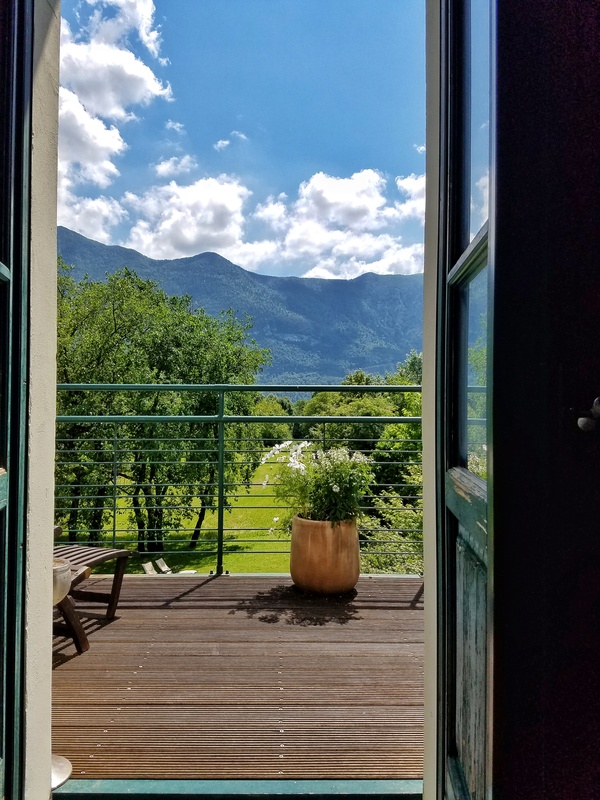 Lake Bohinj itself is surrounded by towering mountains on all sides, and the views of these mountains from the apartments here are just as spectacular as those found on the lake shore. Just behind the apartment, a few steps from our door was a beautiful and clear stream that feeds into Lake Bohinj. Though the water was far too cold to take a dip in, it was a peaceful spot in which to dip our toes. We later followed the sound of the stream to find our way to the shore of the Lake, where we spent some time relaxing and taking in the views. 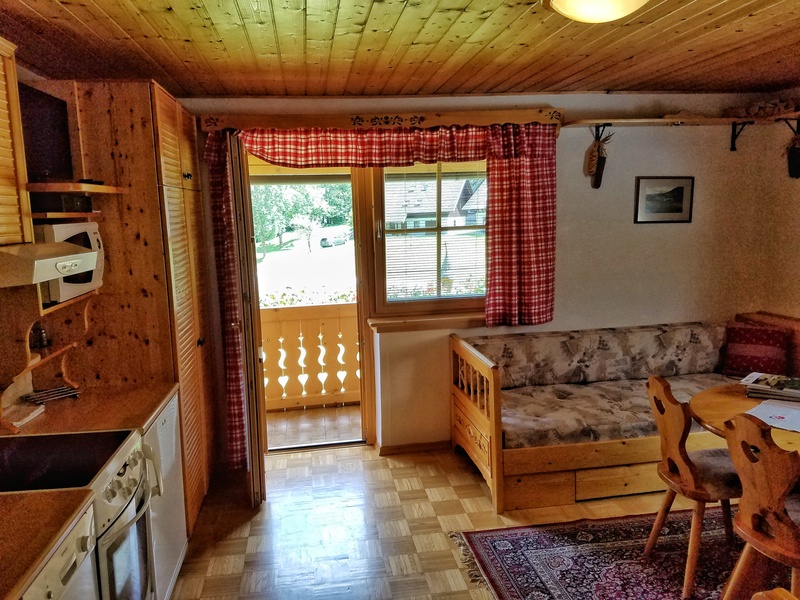 The interior of the apartment is in traditional Alpine style, not a modern touch to be found here, which given the setting, made it all the more charming in my opinion. 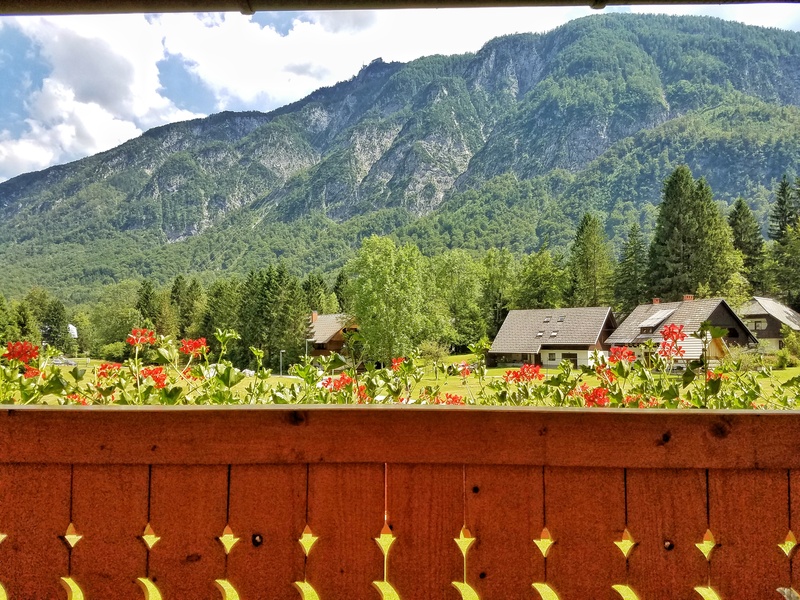 With the village of Ukanc being so tiny, the apartment was in easy walking distance of restaurants, bars, and the lakeshore, and we found the location to be absolutely perfect for our needs. 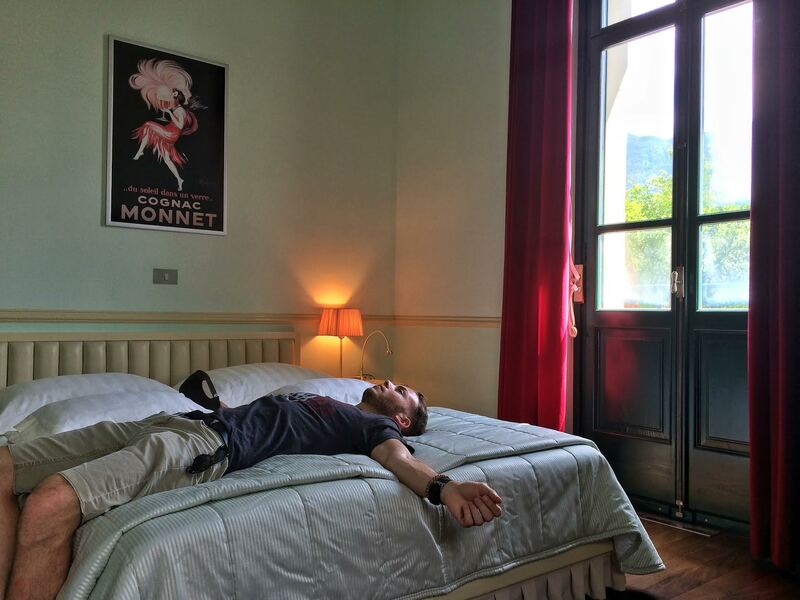 In the end, I was a little sad that we only had one night booked in this charming apartment. Before arriving, I did not have high expectations: I was not envisioning that I would be wowed by this place. 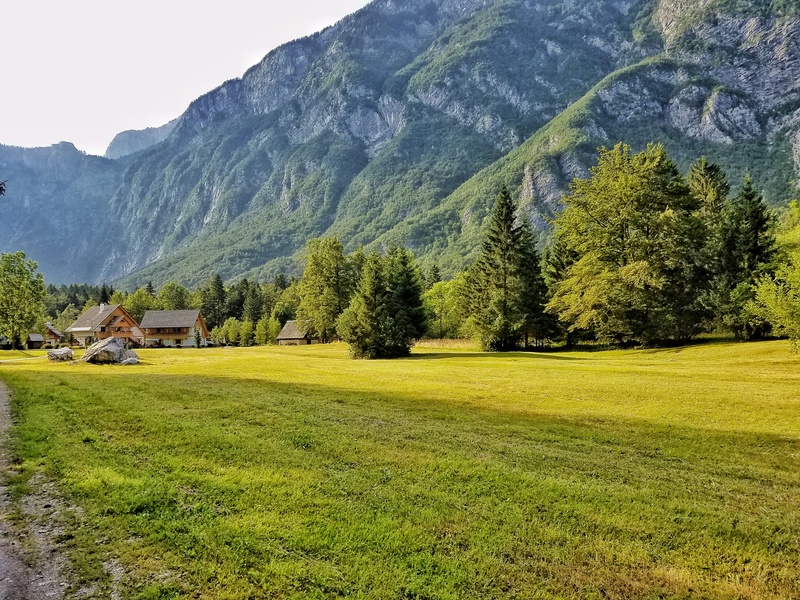 It was mostly just a place I booked as a comfortable place to sleep for the night before we headed onward to the Soča valley where we would be spending considerable more time. 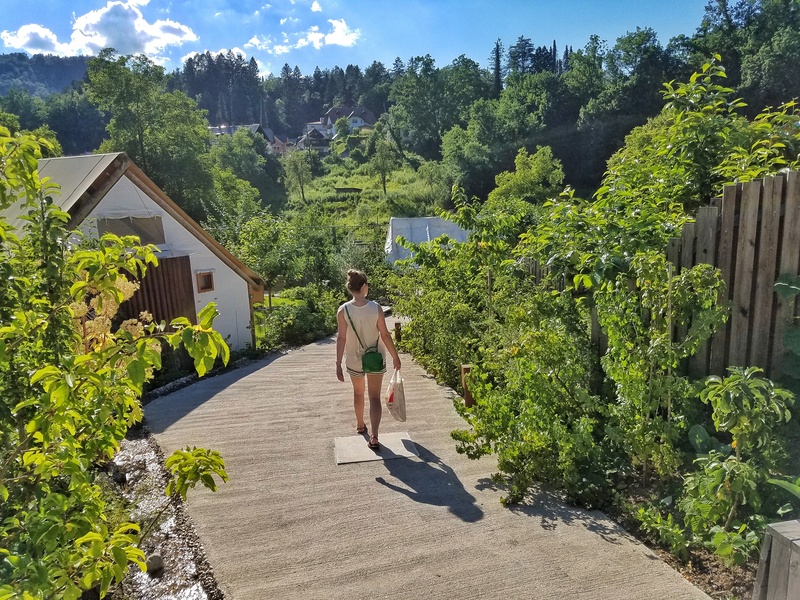 Once getting here, I could have easily spent another 2 or 3 nights just relaxing and enjoying the trails that criss-crossed the entire village and surrounding mountains. Kirk, absolutely! Haven’t been to Croatia yet but all the travelers we spoke to in Slovenia also had Croatia on their itineraries. Also, you wouldn’t believe some of the waterfalls here! I’ll be posting more on the country here soon. Both countries are beautiful. I live in Slovenia and spent summers at Adriatic sea in Croatia. And I love it. Sabina, you are very lucky to call this beautiful country home! 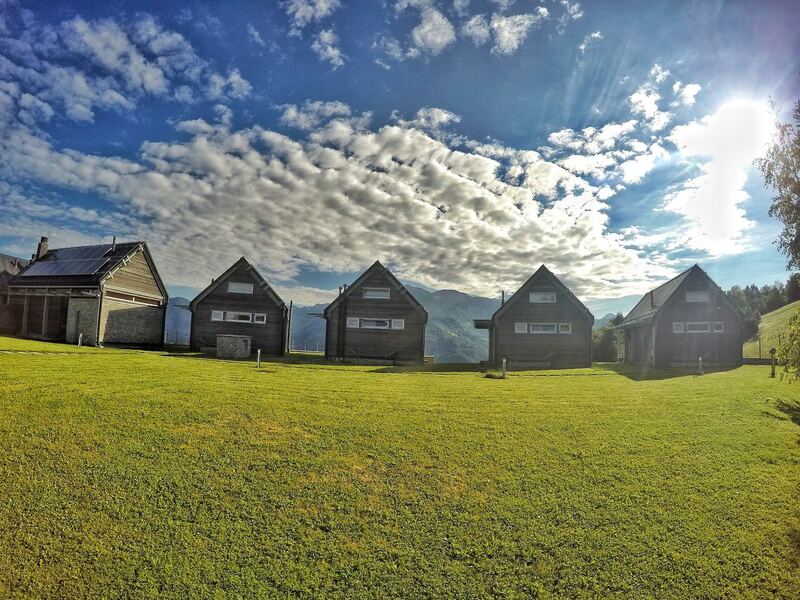 These all look like amazing places to stay! I love the views that many of them offer and who wouldn’t love staying in a tree house, right? I love finding unique and charming places to stay on the road! 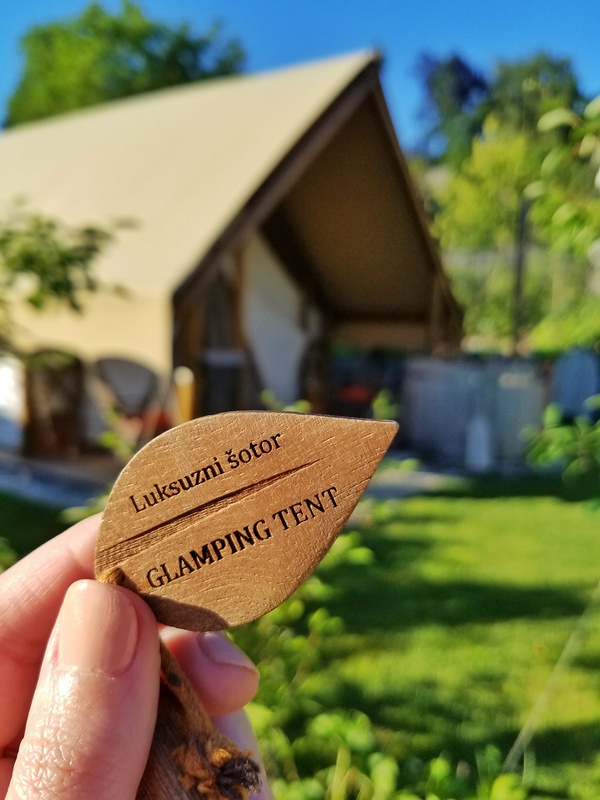 We stayed at Big Berry Glampsite in Bela Krajina region for a few weeks while in Slovenia and loved the nature and tranquility there. So appreciate the time invested in trying all these spots out and sharing the details. I’m going to Slovakia next year but don’t think I’ll be able to follow your footsteps that trip. Never traveling in the region before, I’m very excited to visit. Happened to find your blog again via Pinterest today. Saving this and will be reading it at leisure – hoping to make it to Slovenia / Croatia this year and it’s likely that we’ll need some advice. WOW! 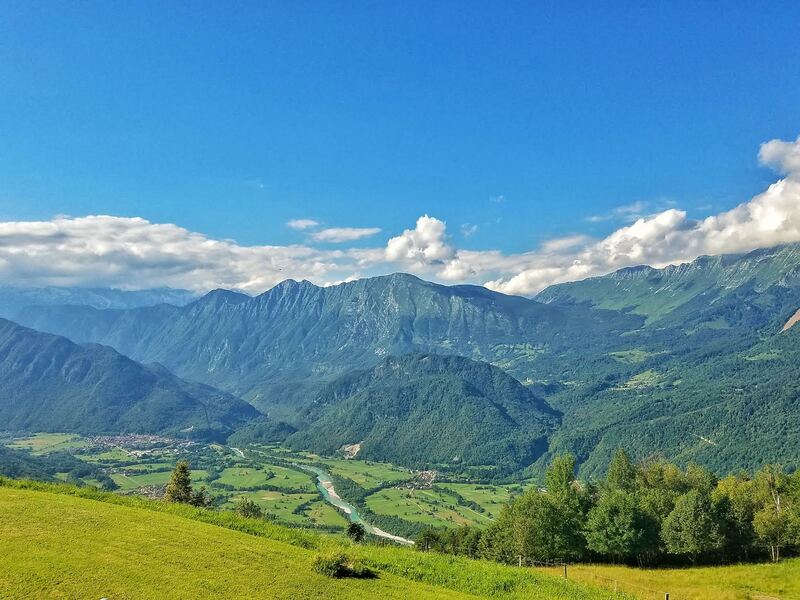 I had no idea Slovenia was so gorgeous. Loving the photos! Maybe instead of Cartagena we will head here! I am from Slovenia, but I like your picture. As Sabina says Slovenia in beautiful and Croatia seasite is also fantastic. We are lucky we are living in this part of the world.